It has been said to me that I’m quite a nosy person. I don’t think that is true, but I must admit to a complete fascination with other people’s bookshelves. There is nothing better than a nicely organised wall of books. I love walking around at dusk when the lights are on but people haven’t yet shut their curtains and seeing what people have on their shelves. (That statement sounded better in my head than written down!) That’s why I was really interested to read the recent post by Cleopatra loves books ‘On my bookself‘ and her inspiration Snazzy books. I’ve seen others who shelve them by colour, others by size, some people don’t keep books in the house donating them straight to charity as soon as they have read them. I imagine there are others of the kindle generation who think bookshelves are all flat screen images. Clearly none of those enviously organised systems are me. I’m definitely a bit of a hoarder when it comes to books, but whilst I wouldn’t give dewy decimal a run for his money I do try and keep a vague system and always aim to store books by category. By far my smallest category is travel books. 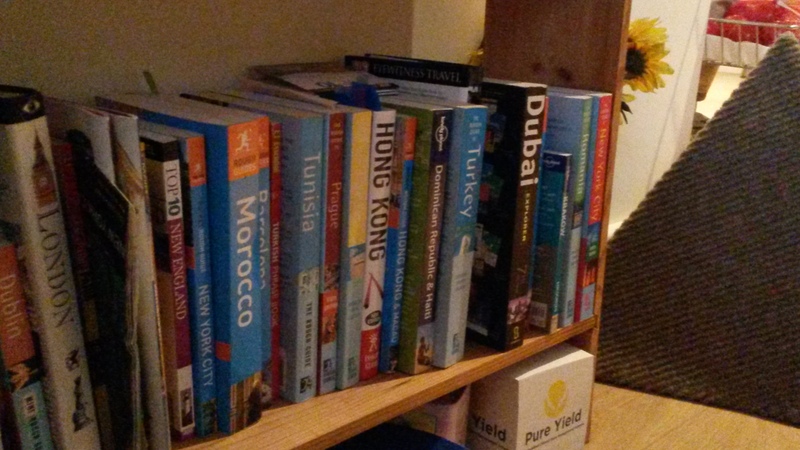 Obviously these are on pride of place by the door – let’s be honest we all put our guidebook selection where it can be seen by guests, unless of course the only travel that’s ever been done is a caravan to Skegness for the weekend. 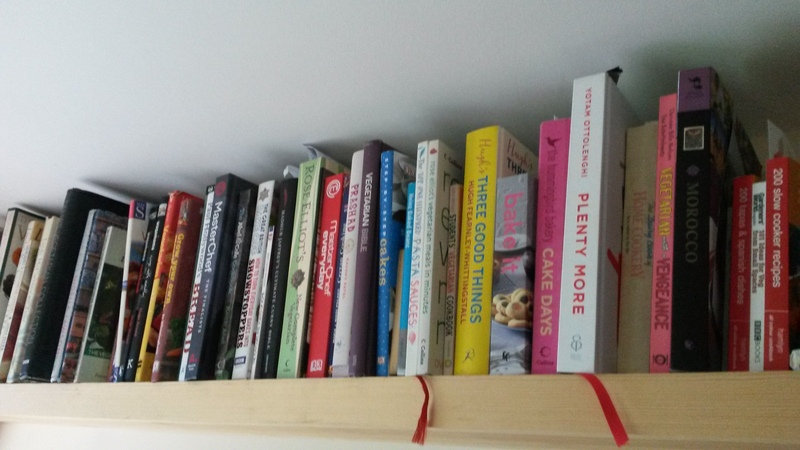 My next shelf is cookbooks, this is quite a large shelf. I’ve mentioned in previous posts that I do love a good cook book. Clearly the majority of my books are vegetarian ones, and I do like to waste a bit of time reading through nice looking recipes whilst waiting for the pizza to be delivered. By far my largest category of books, is crime novels. Even in here there is a vague system. The top shelf is full of those books I’ve got signed, there is then a section for those I’ve not yet read, and there is a special section for those I wish I’d read but never going to try which is hidden behind the curtain. Of course I do wish I was a bit more organised. Over the years I dread to think, not only how many books I’ve acquired by ‘borrowing’ from others and simply forgotten to return, but also how many I’ve lost by lending them and completely forgetting about them. It’s most definitely a case of finders keepers when it comes to books in my house, but I have to admit that to me that’s what books should be about. Whilst I do love seeing the lovely organised shelves of other people, there are not many readers who come to my house and go away empty handed. Although I probably won’t remember what they took the following day, so if you are looking for a new read pop round! Unfortunately the blog has been a bit quiet recently, mainly due to work getting in the way, if only I could read for a living! The reviews might be a bit behind but it doesn’t mean the reading is not still happening and the kindle has been getting a good work out as I’ve spent a lot of time travelling recently. So has my credit card mind you in order to keep up with my demand for kindle books. If only there was a kindle lending library. The card work out is only going to get worse though as I’m off to Hong Kong for two weeks in October so a 15 hour flight is going to need a lot of books. Hopefully some more authors will have been announced for the 2013 festival by then, otherwise all suggestions of books will be gratefully received. My friend’s have a 5 year old girl who nearly enjoyed the day at the zoo as much as me. Spending so much time with a little person was fun (despite the constant stream of conversation from the moment she woke up) it also showed just how much we take for granted. Reading is completely second nature to most people, you don’t think about it, it just happens (apparently its just like riding a bike, although anyone who has seen me attempting to ride a bike this past year would disagree if they managed to stop laughing long enough) But to a five year old its a completely new experience. Like all good parents around the world my friends (who are both keen readers themselves) are constantly making the little girl spell out words and ‘put it all together then’ from the litter bin to the sign for the giant ants. It was like one long game to her, but of course had a more serious side of teaching her to read. It made me realise that reading is just like any other skill, it needs practice and the more you practice the better you get. Equally though to want to learn a skill it has to be something you enjoy. I love reading, I also love books in general and when I can’t read such as on the walk to work I listen to audio books. I’m lucky in that despite my hatred of trains, it gives me lots of time to read and probably explains why I’m quite a fast reader. It does mean though that a two week holiday with a 15 hour flight at each end is going to need a lot of books to keep me occupied! Last Wednesday (after an exciting day full of steam engines and train rides at York Railfest) I went to York Library to see the Crime on Tour event. Peter Robinson, creator of the DCI Banks series which starred Stephen Tompkinson on tv was presenting a ‘New Blood’ Panel discussion. Alongside him were new authors Steven Dunne and David Mark. Sadly there were only about 10 people attending which is always a shame when these kind of events are put on but then the obsession with reading and crime doesn’t extend as far as I’d like I suppose. Despite low attendees the event was great. It was a very informal evening, introduced by Peter where the authors talked about how they had both got published, and how their respective settings had reacted to the book. It was interesting to hear how their publishing journeys differed, David was previously a journalist and ‘The dark winter’ was his first novel. Steven however had written previous books and was now on his third novel, but his first with a more mainstream publisher. There was a big discussion over the difference between paper novels and e-books. David was quite vocal about the fact that he only felt like a real author once he saw his novel in print. I completely agree, whilst I love my kindle I still prefer real books when I can. Where we did differ though was him saying how upset he gets when he sees people mistreating books by folding the corner over, or putting them face down to keep the pages open. I love books and I love the whole process about them including seeing them on my shelves, but I can’t say my books are kept pristine. They have soggy pages from reading in the bath, battered edges from carrying them in bags, broken spines from leaving them open next to the bed. Books are about the content, appearance is secondary is all contexts. There was an opportunity for questions (which is always the point my mind goes blank, and I desperately try and think of something witty and intelligent to ask. What are you having for tea? is probably not the question they want to hear) There was some interesting discussion around how they chose their main protagonists, and why they chose the settings they did. Seeing these authors talking was a great taster for the full festival at the end of July, and I’ve got two new books in my ‘to read’ pile! So yesterday was the first day of my crime reading challenge. With the list of authors sitting printed on my desk I decided first port of call at lunchtime would be the local library. I often visit the library on a Saturday morning but as patience has never been my strong point I didn’t want to wait that long. The local library may be tiny but has a great crime fiction section and is 5 minutes from my office. Don’t get me wrong I realise that even librarians need to eat lunch, and I’m not suggesting we chain them to their date stamps 24 hours a day, but surely just one day of the week they could open the library at some point between the lunching hours of 12.30 and 2.30 to allow those of us with jobs to use them? Libraries to me are as exciting as a bottle of Chianti to Hannibal Lecter – but free and no need for fava beans to enjoy what’s inside. As a child we used to get taken to the library on a Saturday morning and whilst my Dad would sit in the corner pretending to read a newspaper attached to a big chain so it wouldn’t get removed (a practice he now does from the comfort of his own armchair, and minus the big chain) I’d be allowed to wander around the aisles picking out as many books as I could carry. The downside back then was all books had to pass the Mother test, which meant anything perceived as too old or too gruesome was removed from my pile. The trick was to hide the ones I really wanted in the middle of a big pile of teen romance in the hope that it wasn’t spotted. Inevitably this failed more than it worked, but the first time I sat down and read ‘The Outsiders’ by S.E. Hinton was truly a triumphant experience. Nowadays of course I can take out whatever books I like, although once had a very unfortunate incident when I accidently picked up a large print version, it was like being shouted at for 200 pages. However on the whole I’ve never been let down by a library visit, that is until yesterdays aborted attempt of course. Anyway, luckily just like the good Girl Guide I was many years ago I am always prepared, and as a slightly obsessive book hoarder I have a large stack of books at home not yet read so I decided to pick one of them. The two choices that stood out were Kate Mosse ’The Wintergardens’,or Laura Lippman ‘Don’t look back’ I have never read any of Kate Mosse previously, and know that as she is one of the main contributors to the Harrogate Festival this will have to change, however the whole historical thing didn’t really appeal to me last night, so I have started with Laura Lippman. Too early to tell what it’s like but she gets great praise from the fantastic Tess Gerritsen so I have high hopes.